Tired of winter and eager for a moderate and pleasant walk as the hiking season approaches? 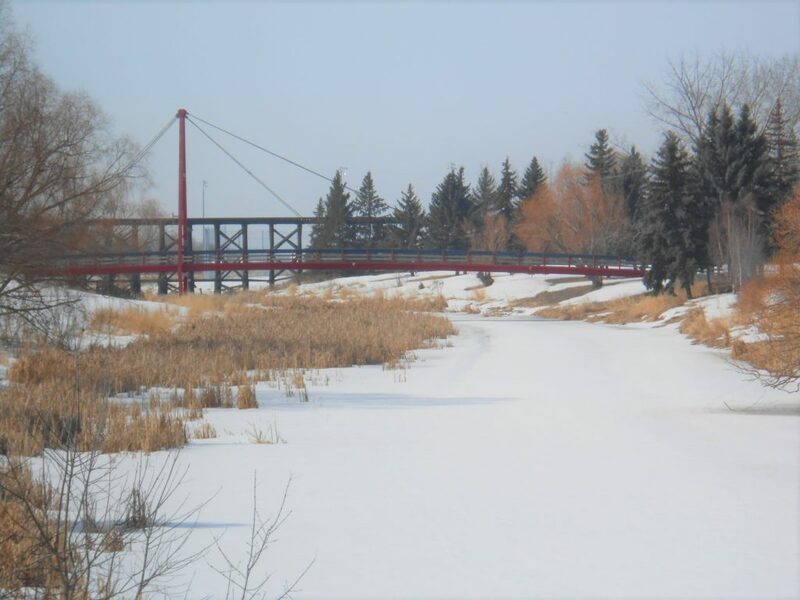 Then join us for our 8-9 km walk along both sides of the beautiful Sturgeon River in St. Albert. These paved trails are already free of snow and mud, making for a pleasant day out. The town has done a wonderful job of preserving shorelines and some wild areas along this river as it winds its way through the city. 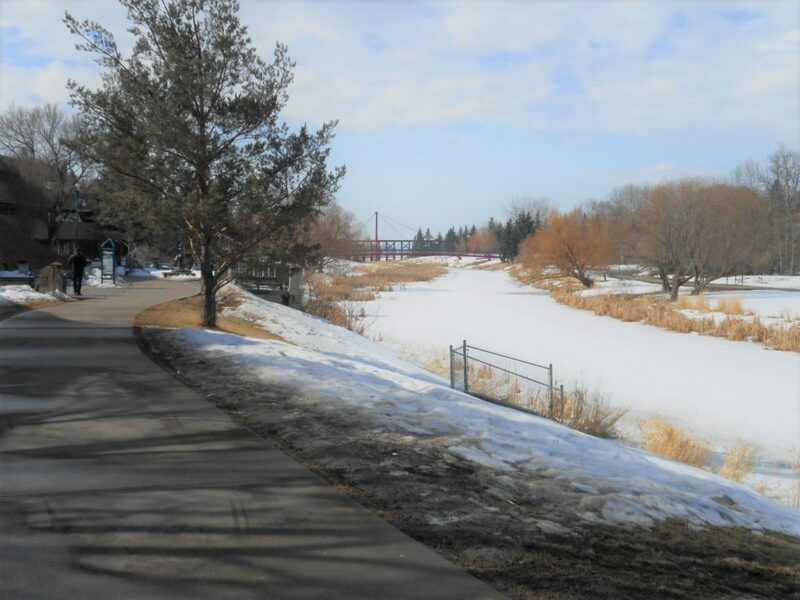 This walk offers plenty to see, but city trails require extra planning for washroom and lunch breaks. 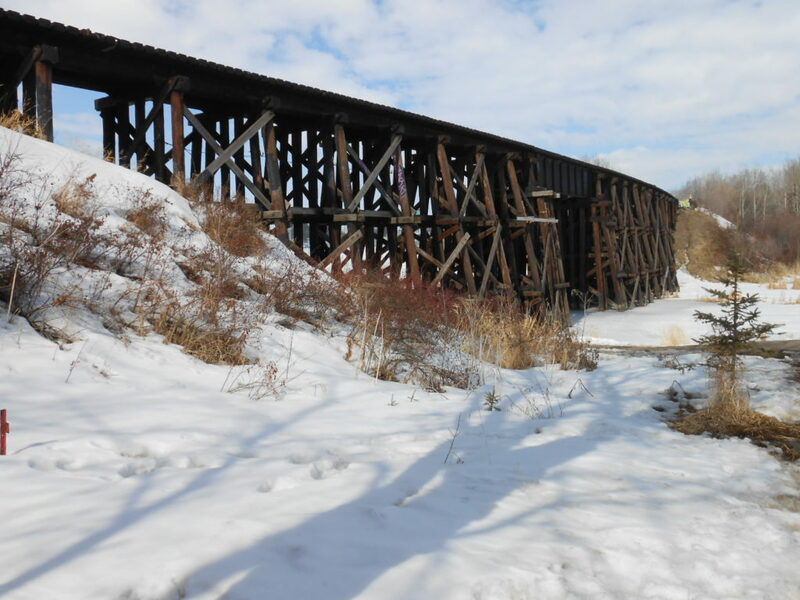 We will start walking from near the southern end of the river, going as far south as the railway wood trestle (built 1906), taking a peak at the restored grain elevators, and then proceeding north and east along the river, crossing over bridges as we go. Half way, we’ll stop at the Good Earth Cafe to warm up and visit the washrooms. Some of us will choose to snack “on the hoof” and have only a beverage at the cafe, while others will have something to eat there as well. After a half hour at the cafe, we’ll be off again, heading back towards our starting point. We’ll walk opposite sides of the river — except for the bridges, we’ll always be walking a different path. Note that we will not be walking all the way to River Lot 56, which has a set of trails (as described in The Waskahegan Trail Guide Book), but will stay close to the river. In Edmonton we will carpool from the Westmount McDonald’s (at 11260 Groat Road — find the Google Maps location here), meeting up there at 9:45 and leaving for St. Albert promptly at 10 a.m. We will arrive back at the Edmonton McDonald’s at 3 p.m. Hikers may proceed to St. Albert directly on their own, but should check the website prior to departure in case of a change (e.g., weather forecast, trail conditions) and contact the Hike Leader Anita P. by email or call 780-524-9817.contact the hike leader (Terry E.) no later than the day before for directions. If you are new to WTA hikes, then you should visit the Guided Hikes web page for essential information. Here are a few pictures taken on 2018-04-10.